Frequency: The trolley runs every 14-20 minutes. Next trolly: Text 12883 to 27299 to get a text telling when next trolley is due. 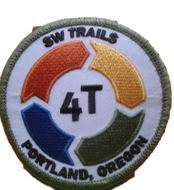 Trail head: Directions to Downtown Trolley at South Waterfront. Tickets: If you don’t already have a valid TriMet ticket, you’ll need to purchase one on the trolley. Adult tickets are good for 2 1/2 hours and cost $2.50 ($1.25 for youths and $1.25 for seniors) . All day tickets cost twice as much. TriMet tickets, while valid, are good for use on both the Train, Trolley, and Bus. Restrooms: At Central Library at end of trip and OHSU Center for Health and Healing at beginning of trip. Reminiscent of the early 1900s when trolleys were the only form of urban mass transit, the ride on the Portland Streetcar is relaxing and fun. For info on vintage trolleys, see here, here, or here. The trolley runs in a continuous 8-mile loop, so you don’t have to worry about the schedule or which one to take — they all go to your destination and they go frequently. 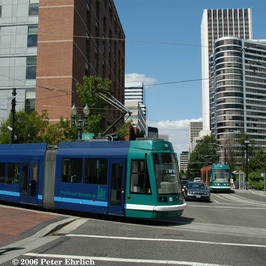 Board the streetcar and enjoy the ride along the South Waterfront which is currently under development. 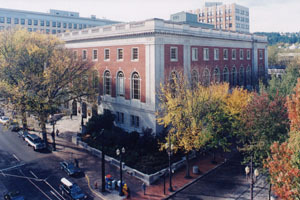 Enter into the University district and cross the South Park Blocks before arriving in downtown. Get off at the Central Library stop. The next leg of the 4T is the train to the zoo. When you exit the trolley on SW 10th Avenue, across from the Multnomah County Central Library, proceed north (following the 4T signs) to the Max boarding area on SW Morrison. There are many restaurants located in this area.